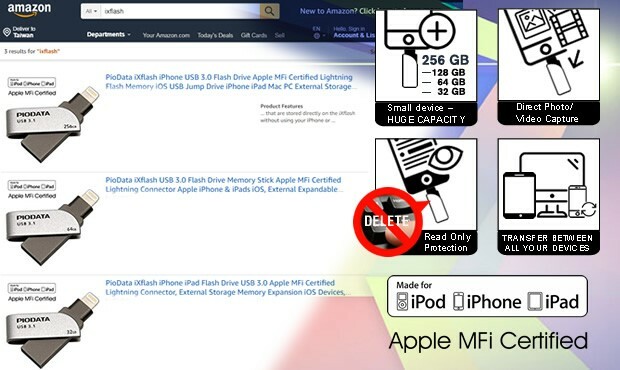 The iXflash Lightning flash drive for your iPhone/iPad has proven to be invaluable for anyone that owns an iPhone or iPad. Not only does it make backing up all of your photos and videos extremely easy, but it is an excellent travel companion for those that are constantly on the go and can’t always take out their laptop. The iXflash can carry all the content in virtually any format, like a mini-hard drive for your iPhone/iPad that works for both business and pleasure. • Read Only Protection: Protect all the photos, videos, and documents stored on the iXflash from being deleted, altered, or infected with a virus by setting it to READ ONLY mode, allowing content to be viewed and copied only. For more details about the iXflash, please visit our website at https://www.piodata.com/CategoryList.aspx?SuperCategoryid=1&Keyword=Mobile_Flash_Drive or contact a Vinpower representative near you.